A foggy early morning view on Mother’s Day from our front porch. Quite a contrast to the traffic Brooksyne and Ester were in on Saturday! Message summary: Today let us make a renewed resolve to faithfully obey the Fifth Commandment to honor our father and mother. For children this is expressed by obeying our parents. For adults it’s expressed by living a life that will bring them honor. 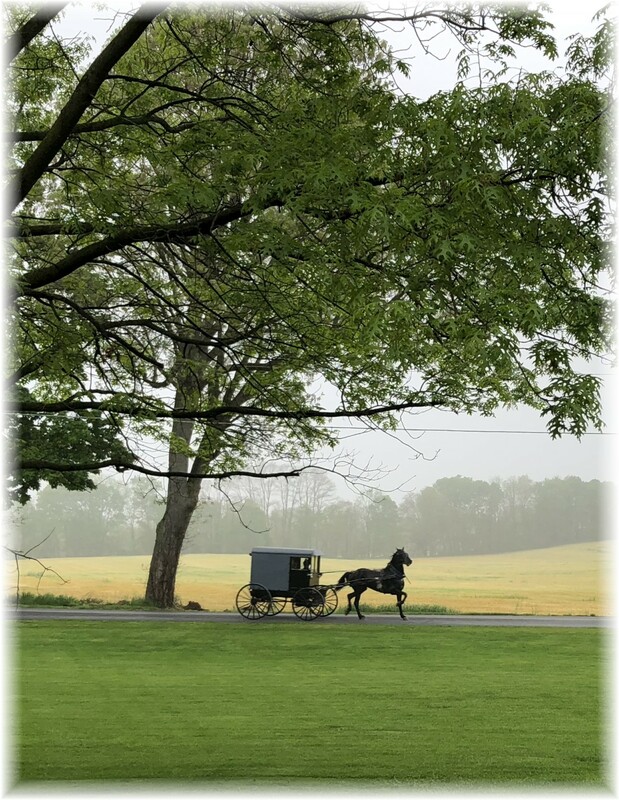 Yesterday was Mother’s Day, which along with Father’s Day, is set aside to practice the 5th Commandment, although we suppose few consider it that way in our increasingly Biblically illiterate age. 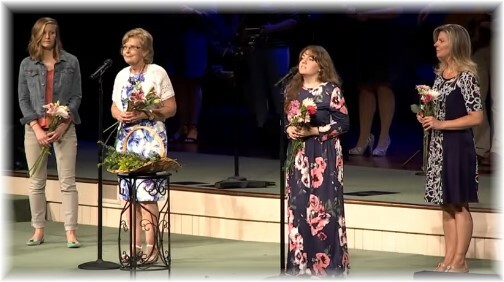 We had a very moving presentation in our church (not your typical Mother’s Day sentiment). Four women in the same family (a grandmother, mother, daughter and daughter-in-law) gave brief descriptions of women who have experienced challenging roles in their motherhood experience; some joyful, others sad. An individual flower was laid in the basket to honor each of them. To watch the video click on the photo below or we also post a link to the video below in our resource section. “Honor thy father and mother”, is the first Commandment dealing with human relations, our responsibility to other people. It really is foundational to the remaining commandments. If this commandment is obeyed the others will very likely fall into place. The human race is blessed, both in the short-term and long-term when this commandment is practiced. When the Apostle Paul quoted this portion in Ephesians 6 he follows with this promise, “so that it may go well with you and that you may enjoy long life on the earth” (Ephesians 6:3). What a blessing to observe this commandment when it is obeyed. And yet it is increasingly violated or virtually ignored by many. And of course in just the last several years we have seen the abominable redefinition of marriage and parenting. Honor describes the disposition out of which obedience is born. In other words, obedience is the duty, honor is the disposition. To honor one’s parents means to show them respect and love, to care for them as long as they need, and to seek to honor them by the way one lives. We believe this expression of honor is not only through our childhood but also all through our lives, including the years following their death. Today let us resolve to faithfully obey the Fifth Commandment to honor our father and mother. For children this is expressed as we obey our parents. To adults this is expressed when we live a life that will bring our parents honor as we uphold respect toward the family name. An even harder commission for some is to bring honor to the family name which has been tarnished by an errant parent(s). “A good name is more desirable than great riches; to be esteemed is better than silver or gold” (Proverbs 22:1). Daily prayer: Father, Your perfect design for creating a family started with Adam and Eve. You gave them tremendous responsibility as parents to raise their children as responsible individuals who would in turn raise their children in the same way. And so your order continues to our own generation. At the heart of our family relations the fifth commandment indicates that we’re to honor our father and mother which includes a promise that we’ll live long full lives. When we honor our parents, Lord, we also honor You and show appreciation for Your marvelous workmanship in our lives. We acknowledge that You ordained the family of our origin and we give thanks to You for our mother and father, brothers and sisters. Make us a blessing to them as the Fruit of the Spirit continues to grow in our lives and is played out in our relations to them. We pray this in the name of Jesus. Amen. Have you told your mom and dad that you love them lately? If not, please do so and let them know of their powerful input in your life. I believe God’s command that we honor our parents is in effect all our lives. Don’t procrastinate! As life progresses and we look back it will never be something we regret. Some of you have strained relations and communication is difficult at best. Maybe you’ve not felt appreciation or love toward your parent(s) for more years than you can remember. Perhaps you had to make the very difficult choice in obeying God rather than obeying your parent(s) as many have been put in this conflicting position. Due to deep hurts or, for some readers, you have been painfully rejected over the years in your stand for righteousness. May God give you innovative ways to show respect to His command in spite of your experience. Do it as unto God and He will bless your endeavor. It will also serve as an example to your own children and others whom you seek to influence. On Saturday Brooksyne and Ester joined some friends for a bus trip to NYC. It was a Mother/Daughter gathering so Stephen was not included. 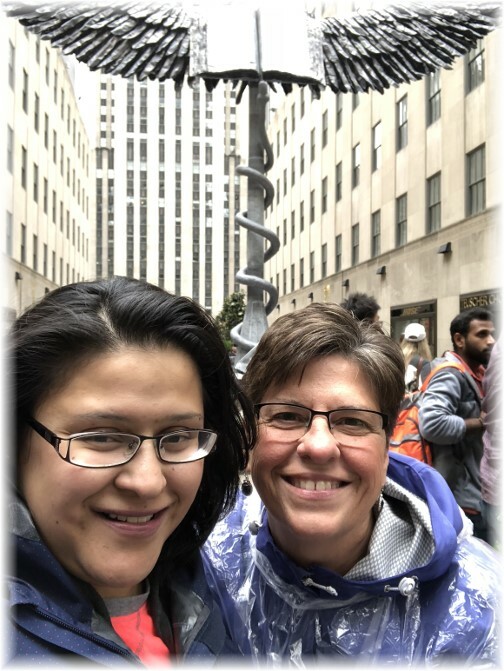 Brooksyne and Ester standing just off Fifth Avenue at the head of the Channel Gardens with a backdrop of Rockefeller Plaza. 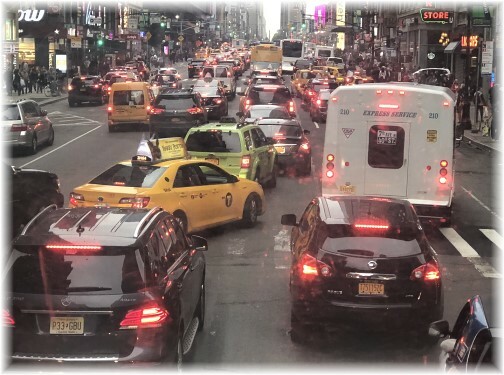 Here is the all too common traffic scene in NYC that we contrast with our peaceful rural view from our front porch yesterday morning in our lead photo! Brooksyne and Ester are sitting on the top deck of a touring bus, thus they’re looking down at the traffic below. It rained several hours during their visit. 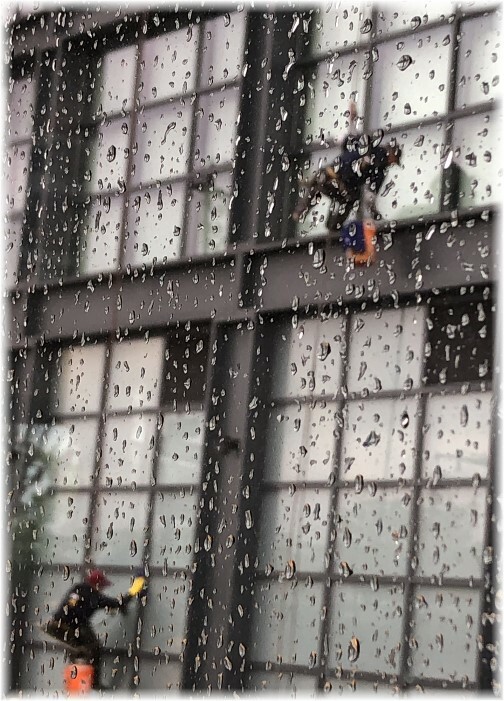 Next time you’re tempted to complain about your work conditions consider these window washers who are actually washing a large skyscraper in the pouring rain! Not a good time to be washing windows but they were doing so. One of the thriving NYC Chick-Fil-A restaurants! 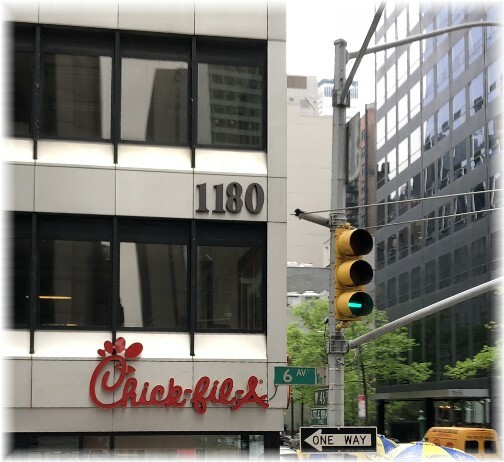 When I saw this photo I thought of this bizarre article I read several weeks ago called “Chick-fil-A’s Creepy Infiltration of New York City” It illustrates just how messed up some people are. Amazing that someone can be “triggered” by a wholesome chicken sandwich! 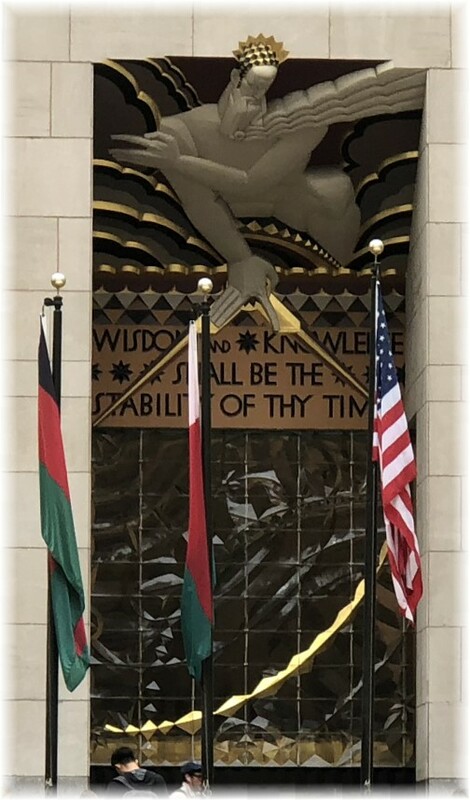 We wonder how many who see this inscription at the Rockefeller Center realize it is a portion of a Scripture verse? “And wisdom and knowledge shall be the stability of thy times, and strength of salvation: the fear of the Lord is his treasure” (Isaiah 33:6). Unfortunately they print only the first portion of the Scripture and no context, leading one to interpret this expression based upon man’s wisdom rather than God’s! To those who are in the trenches with little ones every day and wear the badge of food stains—we appreciate you. To those who lived through driving tests, medical tests and the overall testing of motherhood—we are better for having you in our midst. And to those who are pregnant with new life, both expected and surprising—we anticipate with you.